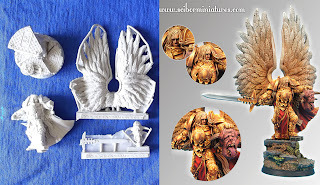 Some time ago, we reviewed few of the products offered by Scibor Monstrous Miniatures. Last time we had a small amount of accessories available, but now, thanks to courtesy of Mr. Scibor, we could inspect far more miniatures. Today we will present another bit of information about Scibor Miniatures company, but most importantly we will review selection of the figures representing the unique and special characters units from 28mm SF Miniatures section. I managed to hold a short conversation with the owner and founder of the company, Mr. Scibor Teleszyński, who shared informations about his company. I have to say it came as a surprise, because most shops or companies representatives and publishers (not to mention owner and a director) don’t have time for such things and don’t care about web sites reviews (sometimes they don’t care about customers opinions). To my surprise, it turned out that almost all designs of products from an online store were singlehandedly created by Mr. Teleszyński! (respect). The only except of that rule are some accessories from Conversion Parts section. Second positive are few small tutorials and presentations of projects which are still in progress. In that way, customers and fans can feel more integrated in the creation process. I have to admit you have to have tremendous talent and discipline to regularly create so many models (maybe in this instance better word will be sculptures than models or miniatures). On the web you can find many galleries with complexly painted figures from Scibor Monstrous Miniatures. Photographs of some of those painted miniatures appear in the Scibor web shop or on the official company Facebook. A large part of these figures is supposedly painted by Polish artists. Truth is that Poland has a lot of very talented miniature painters and sculptors but at the same time, this form of art is almost completely unsupported in Poland. I recommend a look at THIS gallery (actually that one not Polish), you can see there some really good works (including one of the Scibor’s Mech Suits. But let’s go back to the figures. 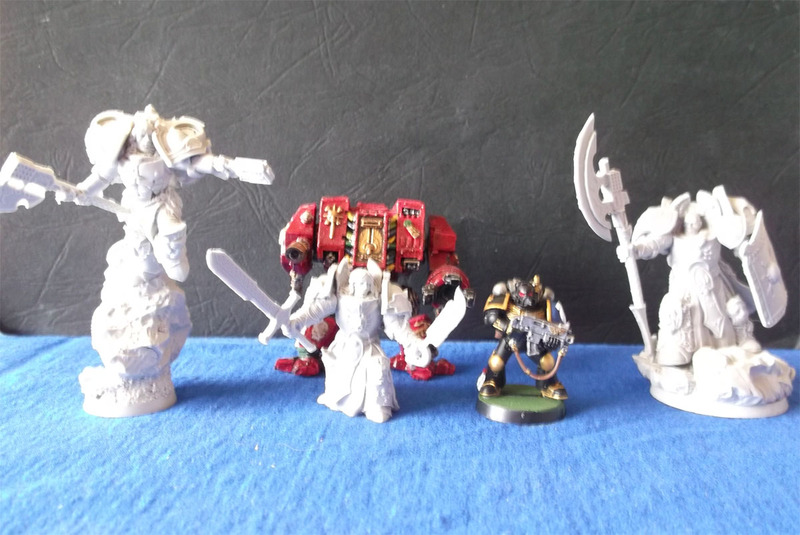 As I mentioned earlier, today we will be taking a closer look on some miniatures from Scibor 28mm SF Miniatures section. This time we focus on more unique models - figures that can be called heroes and leaders. There is quite a lot of them, and unfortunately I cannot describe all, but I hope either way I will satisfy your curiosity. Let's start with the most characteristic of all. 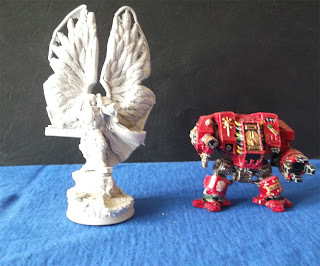 As I mentioned in the previous article, many products from Scibor Monstrous Miniatures suggests some association with the world of Warhammer 40,000. They can be effectively used as a replacement for some characters, and even representations of the officially non-existent product – Primarchs (if not for the game then for the collection). 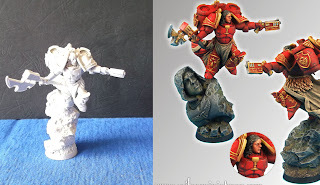 These similarities between Scibor Miniatures and Warhammer are not too large, as everyone knows Games Workshop’s licensing policy (reminds me a bit of Apple current behavior). On the other hand, I really appreciated that Scibor Monstrous Miniatures create patterns of their own, unique, and not just blindly copying existing motifs. Perhaps the most recognizable of the company's products is Archangel. 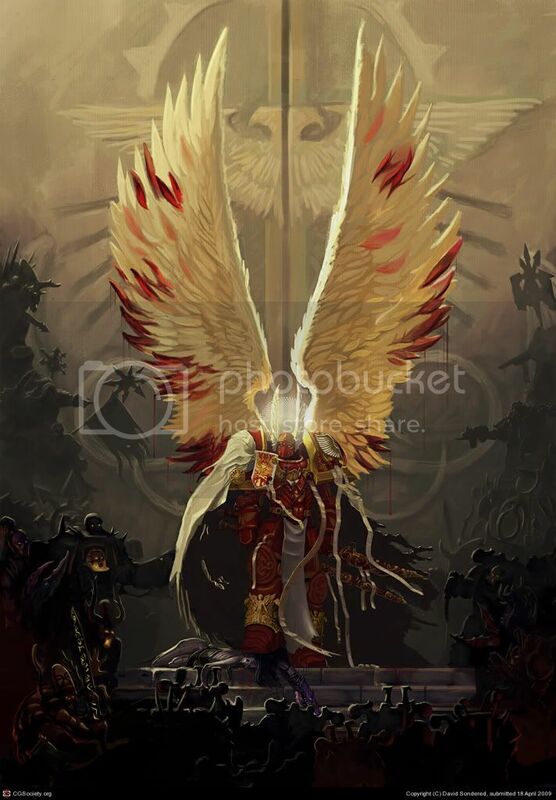 I think it's the best option on the market to create a decent image of Sanguinus (personally I would want to see something more in THIS style, but Scibor figure is close, especially with wings). The first thing that strikes us when watching Archangel are its wings. Well done wings, not thin brittle feathers, but high and quite massive. Those wings are large and hero is in a specific way surrounded by them and seams small in comparison (it is really not small at all). Hero dimensions are 45 mm in height and 40 mm in width but wings are 75 mm height and the about 65 mm in the widest span - that’s a lot. In addition to wings this model is clearly characterized by long hair and soft facial features, matching its angelic form. Armor is not too massive (its even slim comparing to other miniatures) and it is well decorated, coat flowing down the back is a good armor finish. The hero hold in one hand a large sword and in the other, outstretched in front of him, demon’s head. My one complain is that bigger and more expensive figures could be sold with a choice of some additional features or weapons, so I could swap for example hand with head for a shield or pistol or a second sword etc. 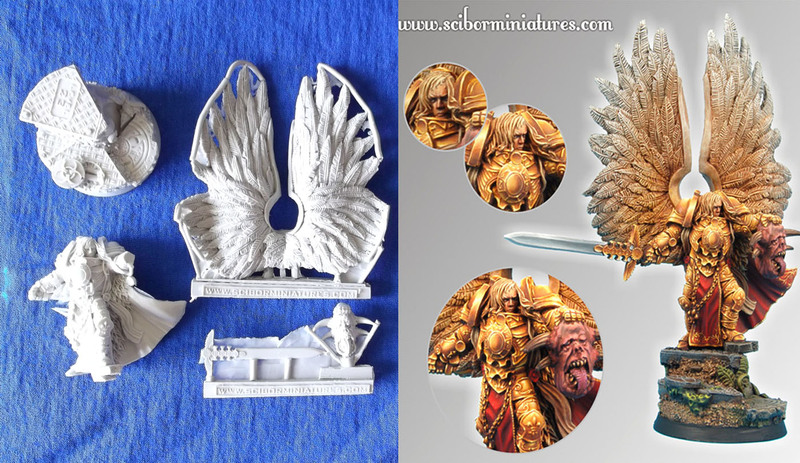 Somewhat similar to the miniature I had described above is the Angel of Death, which in turn brings to mind Warhammer’s Mortarion, Primarch of the Death Guard Legion. That one and the previous model are somewhat similar because of the wings, but the ones on the Angel of Death are even greater (almost 80 mm by 80 mm), hero is also higher and much more massive. The wings look like Archangel, but are bigger and are decorated with blasphemous symbols/accessories, for example in the form of skulls on a chain. Wings support itself looks like made of bone. The figure is quite massive, the whole armor is decorated with symbols that reminiscent Chaos. Armor is cracked in places and seemingly made of bone or stone. Under armor, chainmail fragments are visible. One of the most unusual characteristics of Angel of Death is a strange (and disgusting) tube coming out of mouth and disappearing in the middle of the breastplate. It’s a curious motive, but some people may prefer to have an option to remove it. His head is covered by hood, beneath which lurks distorted humanlike face. It is worth noting that the Angel of Death is armed with a huge scythe, and shoulder armor are really well done, and taking a form of angry or weird faces. With minimal effort, you can easily change this miniature into Mortarion. Since we are already at the "dark side", we should pay attention to two other figures, Chaos Master and Chaos SF Warrior, which, despite the fact that both represent the forces of evil (Chaos), differ dramatically. First can be described as "block" that is not a flaw, but a truly original and daring design. The entire back and shoulders look like a square block of stone with protruding rivets. Head with a few small horns is placed quite low, giving impression of protruding from stone. This effect make Master to Chaos resemble a Terminator or Dreadnought. Model is large and, therefore, has big, badass blunt weapon (sort of mace). Wicked base complete this miniature in more way than one, base is covered with diabolical runes and human heads are protruding from it. Where Chaos Master is large and massive, Chaos Warrior seems to be agile and cunning. Perfectly sculpted hair and features give it a devious look, it appearance reminded me a psychopathic killer crossed with a pirate. His armor is less massive and ornamented. In his right hand he holds a gun, which barrel is decorated with the mouth of the beast. In the other hand miniature is holding a scythe/machete like blade, its handle and sheath are made of some sort of demonic skull. 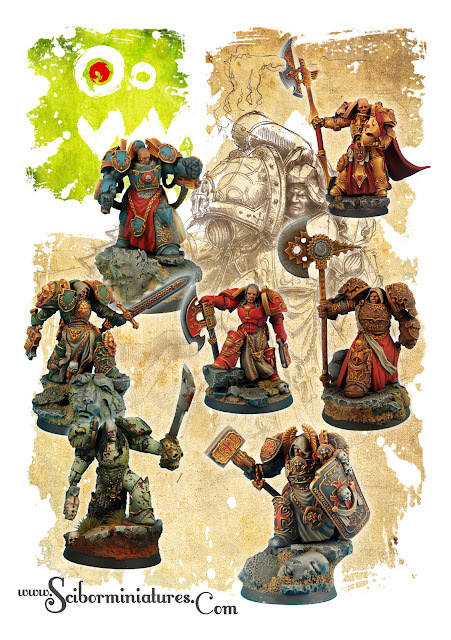 Roman General is a great leader for reviewed previously futuristic Roman legionnaires (which may serve as Adeptus custodes). It seems to be not only a leader, but heavy weapon specialist. On back of his armor there is mounted an extra generator or ammo feeder. His ornate armor and coat is a bit like the Knights Templar, but the most interesting are its arms and shoulders. Below the big gauntlets there are two heavy armor, guns / machine guns with extended, thick belts of ammunition, the visual effect is really good. Eagle Knight also seems to be inspired by the Roman culture, this is a figure that intrigued me, mainly because of the unusual equipment. Model differs slightly from the others, its more natural, common, in terms of facial features, more human, looking at him, you have immediately associations with the characters from Gears of War. His armor is neat and simple, without excessive ornamentation, but the most interesting thing is large, one-handed chainsword, which could be useful at Warhammer 40k either as two handed weapon for space marine or damn big one handed for some hero in terminator armor. Grail Knight SF Jetpack is somewhat “simpler” (it lacks ornaments) than other miniatures. His armor is relatively simple and in the middle of the breastplate decorated only with a small grail and on the knees with symbol of blood drop (in the overall Grail Knight feel a bit like the Sanguinary Guard). What makes this figure unique is its Jetpack (somewhat reminiscent of the Pre-Heresy technology). Other important thing about that model is it base. This time, instead of a piece of land or stone ruins we got a sculpture (a bust), almost the same height as Grail Knight itself. Among our purchases were also two Egyptian miniatures, Egyptian SF Warrior (unfortunately there are only two Egyptian design in shop, a shame, because I like Egyptian motive the most). The first model is a bit like a commander or a veteran. Its armor is very ornamental, it does not have a helmet, but boldly reveals its head. What I like most is that it is armed with two Egyptian swords, one in each hand. The second Egyptian Warrior is a bit like those known from Star Gate universe. Armor is interesting and decorated with scarabs and a variety of other Egyptian symbols, miniature is also equipped with robe. Most striking is the head or rather helmet in the shape of a bird head, clearly inspired by Egyptian art (and probably Star Gate). I would arm it with different weapons (he uses a kind of halberd), but to me it is still one of the most interesting. I regret that there’s so few other Egyptian patterns in Scibor’s shop now. 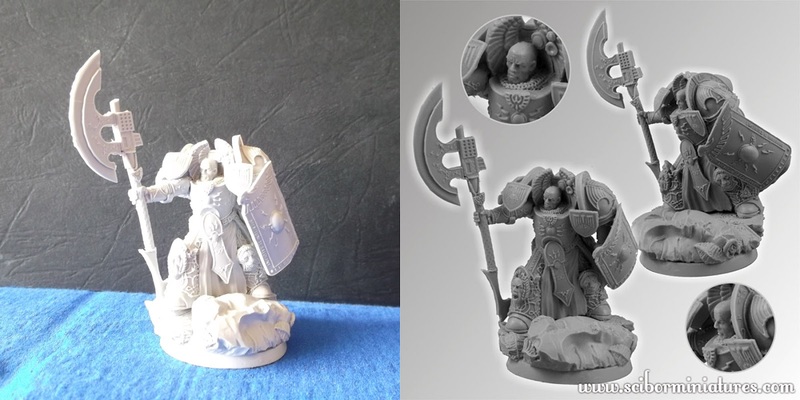 Among the warriors inspired by Celtic art we will find many potential heroes for Space Wolves, and best example of it is probably Celtic SF Lord, which I think fits the role of Chapter Master. It is a miniature that makes a powerful impression, it is set in a dynamic battle pose (look at me and know that I’m dangerous). Celtic SF Lord is clad in very ornamental armor, there are also elements of fur and chain mail in it. At a back we can see coat blown by the wind. Mr. Scibor carved a long and thick beard, and an older face experienced with life, which gives that miniature some real character. Celtic Lord is armed with a long sword covered with runes and runic gun, unfortunately (if I were to be picky) the gun is oddly flat. This weapon seems to be "flat" and “two dimensional” in comparison to other rifles and pistols from Scibor Monstrous Miniatures. As you can see Scibor Miniatures products are really from the top shelf. 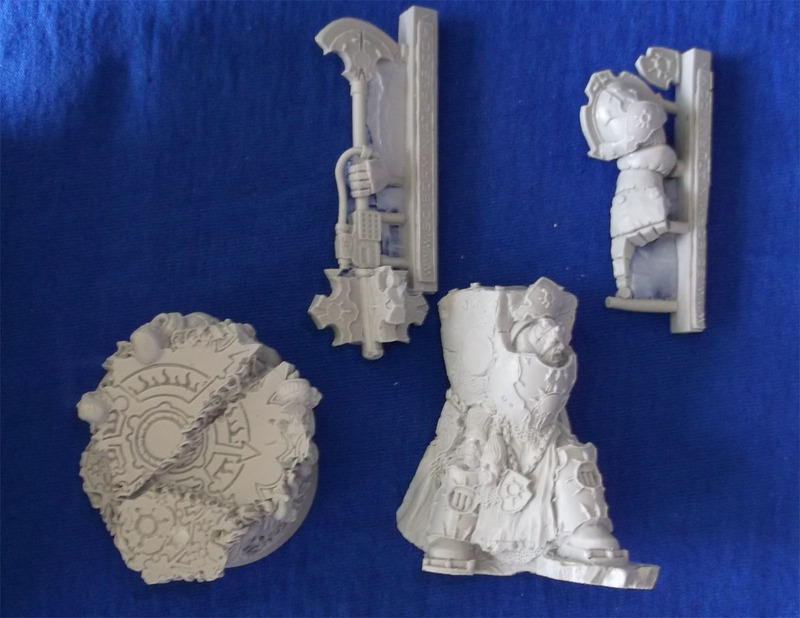 As I mentioned in the previous review, the resin is very good and hard, casts are not damaged or distorted, and the designs are original and interesting to potential buyers (collectors and gamers). I could only draw more attention to two things. The first is already mentioned additional equipment option to the larger (and more expensive) miniatures, so that they can be glued on in more than one version of the weapon or pose. The second issue is the size. It would be great if there were more accessories and weapons to fit the size standards battle games. In this way, you could create your own legion. I think many people would benefit from this opportunity. Unfortunately, partly of my fault, I forgot to order miniatures of the Knights Templar and the Lion Knights, but I hope that I will soon fix this error. At the end I recommend you to peep on this site. This is the Grey Knights Army exhibition, which features Knights Templar from Scibor Monstrous Miniatures. Jakiś czas temu w naszym serwisie pojawiła się recenzja niektórych produktów oferowanych przez firmę Scibor Monstrous Miniatures. Poprzednim razem mieliśmy do dyspozycji niewielką ilość akcesoriów, teraz jednak, dzięki uprzejmości właściciela tej firmy, udało nam się przyjrzeć większej ilości figurek. Dzisiaj przybliżymy kolejną garść informacji na temat firmy Scibor Miniatures oraz przede wszystkim część z figurek reprezentujących bohaterów unikalnych i jednostki specjalne z działu 28mm SF Miniatures. Udało mi się przeprowadzić krótką rozmowę z właścicielem i założycielem firmy, Panem Ściborem Teleszyńskim, który podzielił się częścią informacji dotyczących jego firmy. Zaliczyć to muszę na duży plus, gdyż najczęściej przedstawiciele sklepów, wydawnictw oraz firm (nie mówiąc już o ich dyrektorach, czy właścicielach) nie mają czasu na takie rzeczy i nie przejmują się specjalnie serwisami recenzenckimi (czasem też opinią klientów). Ku mojemu zaskoczeniu okazało się, że praktycznie wszystkie wzory produktów ze sklepu internetowego są autorstwa Pana Teleszyńskiego, wyjątkiem jest niewielka część akcesoriów z działu Conversion Parts. Na stronie firmowej można zresztą zapoznać się z kilkoma małymi tutorialami oraz przedstawieniem projektów będących jeszcze w toku. Trzeba mieć talent i olbrzymią dyscyplinę by regularnie tworzyć taką ilość modeli. Na sieci można znaleźć sporo galerii ze złożonymi i pomalowanymi figurkami firmy Scibor Monstrous Miniatures. Fotografie niektórych z nich pojawiają się na stronie sklepu lub na oficjalnym koncie na Facebooku. Spora część z tych figurek jest ponoć malowana przez polskich artystów, Pan Teleszyński uważa zresztą, że polska ma najzdolniejszych malarzy miniatur na świecie i jednocześnie ta forma sztuki jest w Polsce praktycznie zupełnie niedoceniana (racja). Polecam zerknąć na galerię, nie jest w prawdzie polska, ale można zobaczyć tam kilka naprawdę dobrych prac (między innymi jednego z dostępnych w sklepie mechów), warta obejrzenia. Wróćmy jednak do figurek, które mam opisać. Jak wspomniałem dzisiaj pod lupą znalazły się wybrane miniatury z działu 28mm SF Miniatures. Tym razem skupiliśmy się na wzorach bardziej unikatowych figurkach, które można nazwać bohaterami i dowódcami, jest ich całkiem sporo i niestety wszystkich nie dam rady tutaj opisać, mam jednak nadzieję, że zaspokoją waszą ciekawość. Zacznijmy od tych najbardziej charakterystycznych. Jak wspomniałem już w poprzednim artykule, wiele figurek Scibor Monstrous Miniatures nasuwa pewne skojarzenia ze światem Warhammera 40.000. Dzięki temu, mogą one być skutecznie używane, jako zamienniki niektórych bohaterów, a nawet reprezentacje oficjalnie nieistniejących produktów (wtedy stanowią gratkę głównie dla kolekcjonerów). Podobieństwa te nie są jednak zbyt duże, gdyż każdy zna politykę dojenia i zaskarżania stosowaną przez Games Workshop (przypominają mi w tym trochę Apple). Z drugiej strony należy docenić, że Scibor Monstrous Miniatures tworzy wzory własne, unikalne, a nie tylko ślepo naśladujące istniejące już motywy. Chyba najbardziej rozpoznawalną miniaturą tej firmy jest Archangel. Moim zdaniem to najlepsza na rynku opcja na stworzenie porządnego wizerunku Sanguinusa (osobiście chciałbym kiedyś zobaczyć coś bardziej w TYM stylu, ale figurka ze Scibora, jest dość blisko, zwłaszcza ze skrzydłami). Pierwsza rzecz, jaka uderza przy oglądaniu Archangela, to jego skrzydła. Świetnie wykonane, nie jakieś cieniutkie łamliwe piórka, ale wysokie i dość masywne. Skrzydła są duże i w specyficzny sposób okalają, czy też rozświetlają nieco małą przy nich figurkę (która tak naprawdę wcale małą nie jest). Wymiary postaci to ok 45mm wysokości i 40mm szerokości (rozłożone ręce), natomiast skrzydła mają wysokość 75mm i rozpiętość w najszerszym miejscu ok 65mm, sporo. Poza skrzydłami wyraźnie odznaczają się długie włosy i łagodne rysy twarzy, pasujące do takiej anielskiej postaci. Pancerz nie jest zbyt duży i dobrze, za to pęknie zdobiony, pasuje do niego spływający z pleców płaszcz. Bohater w jednej ręce trzyma duży miecz, a w drugiej, wyciągniętej przed siebie, obciętą głowę demona. Tutaj jedna moja uwaga, wydaje mi się, że takie większe i droższe figurki mogłyby być tworzone z możliwością wyboru jakiejś dodatkowej opcji uzbrojenia lub pozy, np. inna ręka, druga broń itp. Jak dla mnie głowę można by zastąpić tarczą, pistoletem, albo jakimś artefaktem. Nieco podobna do opisywanej wyżej jest figurka Angel of Death, która z kolei przywodzi na myśl warhammerowego Mortariona, Patriarchę legionu Gwardii Śmierci. Ten i poprzedni wzór są nieco podobne z powodu skrzydeł, jednak te tutaj są jeszcze większe, mają praktycznie 80mm na 80mm, sama postać również jest większa. Skrzydła wyglądają podobnie jak Archangela, jednak poza tym, że mają większe wymiary to ozdobione są bluźnierczymi dodatkami w postaci czaszek na łańcuchu a same podpory skrzydeł wyglądają jak zrobione z kości. Sama postać jest dość masywna (taki nieco „blok”), cały pancerz ozdobiono znakami kojarzącymi się z Chaosem. Zbroja jest miejscami popękana i wykonana jakby z kości lub kamienia. Pod pancerzem widoczne są fragmenty kolczugi. Charakterystyczna jest dziwna ( i obrzydliwa) tuba wychodząca z ust figurki i znikająca na środku napierśnika. Mnie podoba się ten motyw, jednak niektóre osoby z redakcji wolałyby, żeby istniała opcja odłączenia tego elementu. Głowę okryto kapturem, spod którego wyziera zniekształcona twarz. Warto dodać, że Angel of Death uzbrojony jest w olbrzymią kosę, a potężne naramienniki to świetnie zrobione obrzydliwe głowy. Przy minimalnym nakładzie pracy można spokojnie zrobić z niego Mortariona. Skoro jesteśmy już przy „ciemnej stronie mocy” warto zwrócić uwagę na dwie inne figurki, Chaos Master oraz Chaos SF Warrior, które pomimo tego, że obydwie reprezentują siły zła, różnią się od siebie diametralnie. Pierwszą z nich możemy zdecydowanie określić mianem „kloca”, nie jest to wada, lecz naprawdę oryginalny i odważny design. Całe plecy i barki postaci wyglądają niczym kwadratowy blok kamienia ze sterczącymi nitami. Głowa z kilkoma małymi rogami umieszczona jest dość nisko, sprawiając wrażenie wystającej z kamienia. Ten efekt upodabnia nieco figurkę Chaos Master’a do terminatora albo dreadnoughta. Model jest duży i w związku z tym posiada odpowiednio wielką broń obuchową. Całości dopełnia diaboliczna podstawka z runami oraz wystającymi z ziemi ludzkimi głowami. Tam gdzie Chaos Master jest duży i masywny, tam Chaos Warrior wydaje się zwinny i przebiegły. Świetnie wyrzeźbione włosy i rysy twarzy nadają tej postaci coś diabolicznego, wygląd typowy dla jakiegoś growego, lub filmowego, psychopatycznego mordercy, skrzyżowanego z piratem. Jego zbroja jest mniej masywna, uwagę za to zwraca zbrojenie. W prawej ręce trzyma on pistolet, którego lufę ozdobiono paszczą bestii, w drugiej natomiast trzyma on ostrze przypominające kordelas, tylko uchwyt i osłona wykonane są z jakiejś demonicznej czaszki. Rzymski Generał (Roman General), to świetny dowódca do opisywanych poprzednim razem futurystycznych rzymskich legionistów (mogących służyć za Adeptus Custodes). Wydaje się on być nie tylko przywódcą, ale i specjalistą od cięższej broni. Na plecach, na swym potężnym pancerzu, zamontowany ma dodatkowy generator lub podajnik amunicji a nad głową umieszczoną ma turbinę. Jego zbroja i okrywająca ją częściowo szata przypomina nieco templariuszy, cały pancerz jest bogato zdobiony, najciekawsze są jednak ręce i naramienniki. Poniżej wielkich rąk znajdują się sprzężone z pancerzem dwa ciężkie pistolety/karabiny maszynowe z wystającymi, grubymi taśmami z amunicją, efekt jest naprawdę niezły. Inspirowany kulturą rzymską wydaje się również Eagle Knight, figurka, która zaciekawiła mnie głównie ze względu na wyposażenie. Model odróżnia się nieco od pozostałych, jest… zwyczajniejszy, pod względem rysów twarzy, bardziej ludzki, patrząc na niego nie masz natychmiast skojarzeń z bohaterami Gears of War. Jego pancerz jest schludny i prosty, bez nadmiaru ozdób, najbardziej jednak rzuca się w oczy duży, jednoręczny miecz łańcuchowy, coś takiej wielkości przydałoby się w Warhammerze. Nieco prościej wykonany jest Graal SF Knight Jetpack. Jego pancerz jest stosunkowo prosty, zdobiony na środku napierśnika niewielkim kielichem, graalem i na kolanach symbolem kropli krwi (w całościowym odczuciu nieco podobny do Sanguinary Guard). Tym, co wyróżnia tą figurkę to Jetpack (przypominający nieco te z Pre-Heresy) oraz podstawka. Tym razem zamiast kawałka terenu czy ruin dostajemy kamienne popiersie, rzeźbę praktycznie tej samej wysokości, co sama figurka. Wśród naszych zakupów znalazły się również dwie egipskie figurki Egyptian SF Warrior (niestety wzorów egipskich jest obecnie bardzo niewiele, a szkoda, bo podobają mi się najbardziej). Pierwszy wzór przypomina nieco jakiegoś dowódcę, weterana. Zbroja jest bardzo ornamentacyjna, nie posiada on hełmu, lecz śmiało odsłania głowę. Najbardziej podoba mi się to, że uzbrojony jest w dwa egipskie miecze, po jednym w każdej ręce. Drugi z wojowników przypomina trochę postacie znane z Gwiezdnych wrót. Poza niezwykle ciekawym pancerzem ozdobionym szatami, skarabeuszami oraz przeróżnymi innymi egipskimi symbolami, uwagę zwraca głowa figurki, przedstawiona, jako hełm w kształcie łba ptaka, wyraźnie inspirowany sztuką egipską (i chyba Gwiezdnymi wrotami). Ja uzbroiłbym go nieco inaczej, jednak i tak jest to jedna z najciekawszych dla mnie figurek. Żałuję nieco, że tak mało jest wzorów egipskich. Wśród wojowników inspirowanych sztuką celtycką znajdziemy za to wielu potencjalnych bohaterów do Kosmicznych Wilków, najlepszym z nich jest chyba Celtic SF Lord, który moim zdaniem idealnie pasuje na mistrza zakonu. Jest to potężna figurka, jednak ustawiona w dynamicznej, bitewnej pozie, mówiącej patrz na mnie i wiedź, że jestem groźny. Odziany w zbroję bardzo ornamentacyjną, do tego pojawiają się też elementy futra i kolczugi, z tyłu natomiast wyłania się rozwiewany wiatrem płaszcz. Autor wyrzeźbił długą i gęstą brodę oraz starszą, doświadczoną życiem twarz, co nadaje miniaturze charakteru. Celtic Lord uzbrojony jest w długi, pokryty runami miecz, oraz runiczny pistolet, niestety jeśli miałbym się do czegoś przyczepić (bo to też jedna z lepszych figurek), to właśnie do pistoletu, dziwnie płaski. Broń ta wydaje się „chuda” i „spłaszczona” na tle innych karabinów i pistoletów ze Scibor Monstrous Miniatures. Jak widać produkty Scibor Miniatures stoją na wysokim poziomie. Jak wspominałem już we wcześniejszym tekście, żywica jest bardzo dobra i twarda, odlewy nie są uszkadzane, czy zniekształcone, a wzory są oryginalne oraz ciekawe dla potencjalnych nabywców. Tym razem zdarzyło mi się zaobserwować nieco większe nadlewki, ale nie było to nic, z czym nie dałoby się poradzić. Mógłbym zwrócić jedynie większą uwagę na dwie sprawy. Pierwsza, to wspomniane już dołączenie „opcji” do większych figurek tak, aby można było je skleić na więcej niż jedną wersję broni lub postawy. Druga sprawa to wielkość. Byłoby super, gdyby pojawiły się akcesoria i bronie bardziej pasujące wielkością do standardów gier bitewnych. Dzięki temu, można by utworzyć na przykład własny legion (wystarczy trochę naramienników oraz ozdóbek i tyle), sądzę, że wiele osób skorzystałoby z tej możliwości. Niestety, częściowo z mojej winy, nie udało mi się jeszcze przyjrzeć figurkom Templariuszy oraz Lwich Rycerzy, mam jednak nadzieję, że już niebawem naprawię ten błąd. Polecam zerknięcie na tą stronę. Jest to wystawa armii Grey Knights, w której wykorzystano między innymi oddział Templariuszy ze Scibor Monstrous Miniatures. Nie jest źle, tylko dlaczego tak drogo :P. Scibor faktycznie ma zaj... figurki, ale są też inne fajne sklepy ( w większości polskie). Teraz chyba właśnie wyszły u nich mniejsze naramienniki i jakieś nowe ozdóbki na pojazdy, fajnie będzie można pomyśleć o czymś do armii. Will you review new Conversion sets, those for Land Raiders? I’m also interested in something more about mechs. Quick translation of original review, sorry for any language errors. I would prefer to see something from fantasy but sf is ok Next time post english video or add subtitles. It’s nice, but I’ll wait for more „heavy” stuff, mechs suits or motorcycles any mutants/chaos maybe?